It’s easy to force a hyacinth in a bulb vase. In early autumn, fill the vase with water, and add a piece of aquarium charcoal, if you wish, to keep it sweet. When the bulb is in place (pointed tip up), the water should just touch the bulb’s basal plate. The basal plate is the flat bottom of a bulb, from where roots emerge. 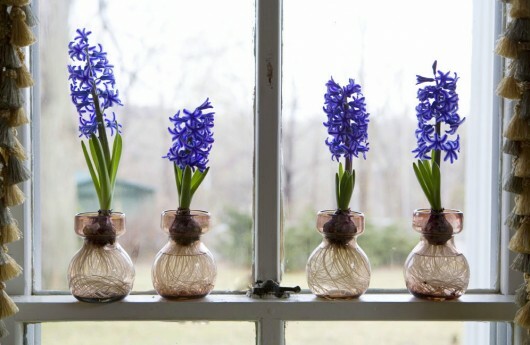 Where to find bulb vases? Your local, independent florist can order them for you. If you’d prefer to order the vases online, check this source. Like all Dutch bulbs, a hyacinth grown in a vase needs to make its roots in a cold, dark place. I find that a shelf in my spare refrigerator works very well, providing fresh fruit is kept out. Ripening fruit gives off ethylene gas, which can sterilize bulbs. You don’t have a spare refrigerator? Well, perhaps you can find some other dark, cold (35-45 degrees) place for your bulbs. A cellar, attic, or garage might be bulb-storage possibilities for you. As roots grow, top off the vases with more water as necessary. After twelve weeks have passed, bring the hyacinths to a sunny but cool window. The flowers will last for weeks if temperatures do not exceed 65°F. To encourage sturdy, upright growth, give the vase a quarter-turn every other day. Or, arrange several vases on the latch ledge of a window. As the flower stalk leans toward the light, the window glass will keep it from toppling over. Hyacinths are fun to display. One winter, I arranged a “Spring Portrait” (pictured above) in my parlor. Plant stand, bottom shelf: Lavender and white Primula obconica. Top shelf: pink Begonia semperflorens and forced branches of forsythia. 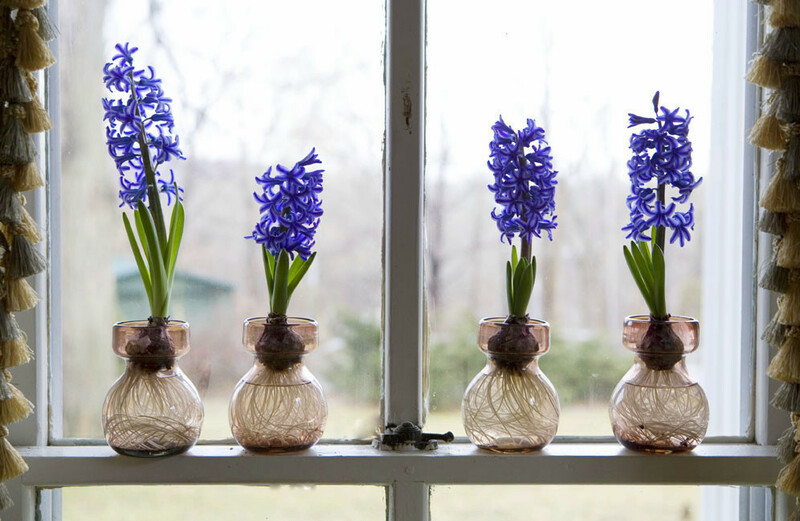 Window ledge: ‘Blue Jacket’ hyacinths, forced in small, amethyst-colored vases. .
Well, I hope you’ll consider forcing a few hyacinth bulbs for indoor winter enjoyment. You’ll be happy to have the color and perfume when the snow falls in January. 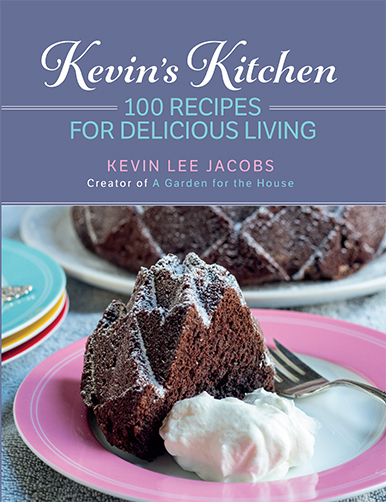 Don’t miss anything at A Garden for the House… subscribe to Kevin’s weekly newsletter. Kevin, That “Spring Portrait” is just gorgeous! I’ve been sorely unsuccessful with forcing. I still have yet to keep an amarylis to bloom two years in a row. Fingers crossed! Maybe this year I’ll try to be more proactive and do it right this time! Hi Donna B. – Glad you like the spring scene above. As for amaryllis, they need copious food and water during the summer holiday. The bulbs use the nourishment to form an embryo flower for the following season. I feed mine with every watering during summer, at the rate of 1/4 tsp per gallon water. Keeping my fingers crossed for you! I didn’t know you could force bulbs in just water, no soil. Would the vase have to be hour-glass shaped to hold the bulb up and give the roots room? We have our community rummage sale at the school this weekend. Maybe I’ll get lucky and find some vases that shape. 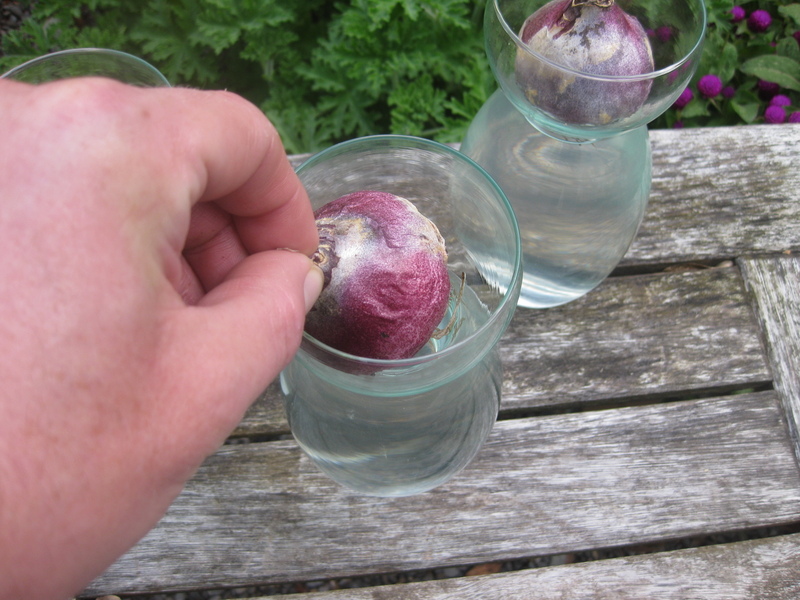 badger gardener – Bulb vases, or “hyacinth glasses” feature a cup at the top to support the bulb. Sometimes you can find these Victorian inventions at rummage sales. I’ve seen them at “juntique” shops, too. My amethyst-colored vases were ordered from a local decorator store; I found the clear-glass vases at a local florist’s shop. The vases are fun to collect! Hi Lynn – I should think that 6 white hyacinths in a bowl of glass beads would be a sight to behold! You may not need the stemmed wine glasses at all — probably the bulbs will be nice and secure as their roots grow into the beads. Just keep water in the bowl. Looking forward to seeing pix on FB. Do you need to use any fertilizer when grown in water? The flower stalks are forming now. How long are hyacinths suppose to last once they’ve started to bloom..I have one and doesn’t seem to have lasted very long..I have another they blooms are just starting to peek out, but it’s leaning a lot, I almost want to fix it, but what can I do to straighten it up, and also should it get alot of water, I have them in soil? Thank you in advance! 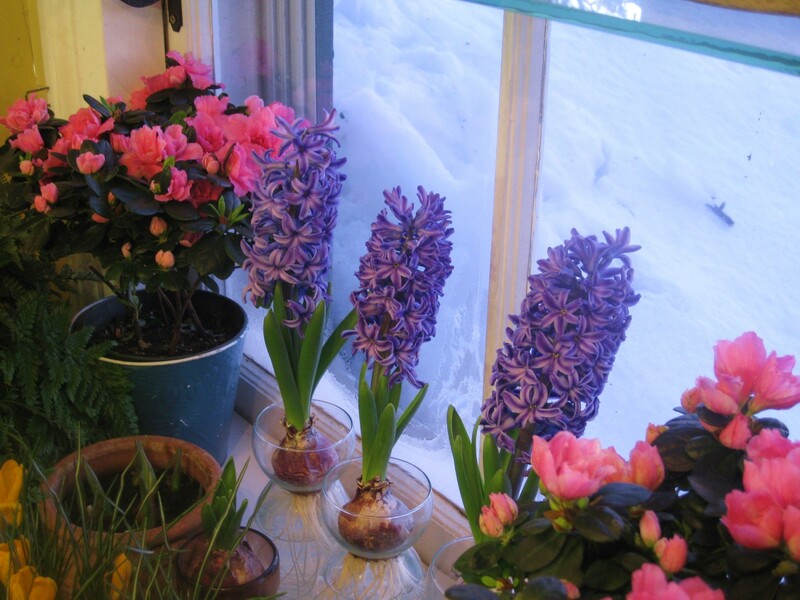 Hi Emma Garcia – In a not-too-warm room (65 degrees maximum), hyacinths will last for about 2 weeks. Give the pot a quarter turn every day to keep the flowers from leaning toward the light. (If the bulbs were planted in a too-soft potting mixture, they might lean anyway, because their roots are not secure.) Definitely provide plentiful water. Provide food, too, if you intend to save the bulbs for future planting outdoors. I have just forced my first hyacinth in a bulb vase and was thoroughly pleased! Now that it has died back, I need to know how to store the bulb with all its long white roots. I have another one started, so look forward to the beauty of these flowering bulbs! Thank you for your help. After it blooms will it bloom again? What do I do? Hi Ann P and Cajun Sue – If forced in water, Dutch bulbs (like hyacinths) are not likely to bloom again, even if you let the foliage remain until it withers away naturally. Water forcing is hard on them, and seems to zap all their flower-producing energy. Dutch bulbs forced in soil, however, can definitely have a future in the garden outdoors. How many months will bulbs remain viable when kept dry & refrigerated? I wanted to start forcing just one per week and have flowers for as long possible. What would be the optimal temperature for this? Hi Kevin… I have discovered… To my delight… An even easier way to force hyacinths. Simply put the bulbs in a paper bag and stash them in the fridge for 10-12 weeks. Then, when you are ready to force them, take them out and pot them up in potting mix… Or put them in a glass forcing jar. I then put them in a dark, cool place for a couple weeks while the roots grow out… I use a shelf in my basement. After that, a sunny window to bloom. I found the “bag method” in Brent and Becky’s fall catalog a few years back and have been using it successfully ever since. Just a heads up — after I don’t know how many years of never having an issue, I suddenly became dreadfully sensitive to hyacinth bulbs — after handling them and touching my neck, it felt as if I’d been stung by bees there. Swelling, rash, the whole shebang. And based on google, this is not an uncommon problem. So you might consider wearing gloves and being a little careful while handling them and anything they come in contact with — I think it’s the skin of the bulbs, not the foliage or flowers, but I’m not going to spend a lot of time trying to test that theory. 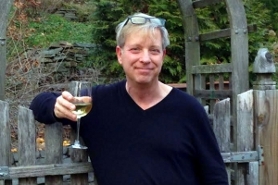 Hi Scott – I have a quasi-scientific experiment in my fridge just now. It involves tulip bulbs. I potted some, and let others remain in a paper sack. By mid-January I’ll be able to determine which bloom first — the bulbs which were allowed to make their roots early on (as in nature), or those which were chilled first, and then potted. If both bloom equally-well, and at the same time, you can bet I’ll use the chill-in-a-bag method exclusively from here on! Sandy H. – Hyacinths are notorious for causing skin irritation. I don’t recall if it’s the bulbs themselves or something with which they’re treated. The stalks, leaves and flowers should not cause a problem but the bulbs frequently do. I feel like we may be neighbors since I am in Zone 5. I JUST WANTED TO THANK you for posting that fantastic formula for cleaning windows and picture glass. 45%water, 45% rubbing alcohal and 10% ammonia. I’ve been using on my storm windows and discovered it cleans the sides of my trailer beautifully. Takes out dripping from roof and green algae. Fantastic! I just happened to be surfing the web one day, and clicked on your website (now I subscribe). You are amazing. Your website is amazing! Thank you for all your tips, tours, and tidbits! I truly enjoy all your posts, and getting caught up on the things I missed. Thank you for brightening each day! Thanks Sandy! I stopped by a local store yesterday to pick up some hyacinth bulbs because I was inspired by this site to have some color for Christmas. Before I was even out of the store my neck and face were incredibly itchy. I assumed it was a chemical in the store. Came home and took some Benadryl. Sounds like it could have been the bulbs. Maybe I will just grab some gloves and stick them in the ground and pick up something else for forcing! Off… Will this hinder it’s growth? We received mums, hyacinth, and cypress potted plants. Friends presented, hoping we will be able to plant outdoors in spring, to honor my father’s wonderful life. Wondering if cooler basement/limited light would be better conditions than better light/heated Wisconsin home. Any feedback would be appreciated. Thanks. Hi Ann of Pa — Glad you sent this link. Etsy is using my photograph without permission. I just sent them a note. I have had excellent luck just filling a bag with the bulbs in the fridge. After 10 to 12 weeks, every week, I put a couple in the vases with water and have a more or less constant supply of blooms (until I run out). Gorgeous plant portrait I don’t think i can find a cool enough place in my house to force the critters, but I will try . It does get cold in Ga and oddly enough the people in the house want it warm inside! I have just been thinking this week about the seeds I’m going to order for this winter’s milk jug greenhouses (What a hugely successful project that was for me!) and I was already planning for the new row of boxwoods I’m going to start from cuttings. Now you’re telling me I can use my garage to get some bulbs going. Why didn’t I think of that? t really appreciate the knowledge you share so freely, Kevin. Do you ever have hyacinth bulbs that just don’t get growing and they stay in a bulb like state and never bloom? I get mine every year from a reliable source and when I buy them I can see the tip of the flower stalk, it’s usually white or yellowish green.. I buy them, pot them up and keep them in a spare fridge or hyacinth vase and if I did this with say 25 bulbs, I bet I would have at least 5-6 that would never bloom…for the same reason, I only buy amaryllis bulbs where I can see the big bud… Some that have not emerged from the base don’t ever… Any thoughts? Thanks! Beautiful window garden! how do you open the window? I am looking for assistance with finding forcing vases in single or bulk packaging. I love to grow plants and am looking to give these as gifts. Do any of the folks here have any recommendations as to where I can find these? Hi Kevin! I am very new at this being I only started trying to garden 1-1/2 years ago (in 2013) when I moved to NJ. I made a friend of someone who gardens rabidly. There were a few hyacinths growing on the property. My friend told me to put the bulbs in a pot when they withered in Sept/Aug. I did that last fall. This morning (1/15) I stepped out on the patio where the pots were and saw that they had started to grow!! I was amazed as it’s very cold outside. My friend told me to go online, which is where I found you. Thank you, thank you, thank you. You were the first link I tried with my google question, and I will follow your directions to a T. I’m now off to try to find those bulb vases. Wish me luck!!! Happy New Year, Kevin! I have a bulb that just finished blooming, it is in water. I need to know what to do next with it? Should I let it dry out and then plant in in dirt or what? I understand often they will not bloom again, but I figured I dont have anything to lose, what should i do with this? I live in Minnesota. Is my enclosed (but not heated) porch too cold to keep bulbs for forcing? (Weeks of subzero days/nights). Or would I be better off with the fridge-paper bag method? I have a pink hyacinth in a water vase i bought from my local grocer, it has wonderful white roots and is growing quickly, can i transplant this lovely lady in soil? And as far as feeding goes how often and what ratios? Would a basic tomato miracle grow work? I also have nitrogen. This is my first hyacinth. Also are you familiar with phalaenopsis orchids? Any help would be greatly appreciated!!!!! Hi Paula and Serenity – While hyacinths forced in soil can definitely have a future in the garden outdoors, those forced in water are not likely to bloom again. But if you wish to try, just keep the plants in full sun until their leaves wither. Add water to the vase as needed. You can feed the bulbs, too, with a high phosphorous fertilizer (1/4 teaspoon dissolved in a gallon of water). Jack’s Blossom Booster is one such high-phosphorous plant food. After the leaves turn yellow and wither, withdraw the bulb, and let it dry out. Then store in a cool, dark, and dry location until the autumn. Hi Aimee – While bulbs which are already rooted can withstand freezing temps, their unplanted, unrooted colleagues often perish. I never store bulbs in paper bags in the refrigerator, as the method has not worked well for me. I always plant or vase the bulbs first, and then give them 10-12 weeks of dark, cold storage (35-45 degrees F. is best). Ok, just bought some hyacinth bulbs, going to give this a try. Into the beer fridge they go. 12 weeks is along time to use up space in the beer fridge, last time I tried this someone took my bulbs out and set them aside on my porch and they froze ! Grrrrrrr …..
Hi Lynn Paterson – Beer fridge – great idea. Have fun with your hyacinth-adventure! I plan to force my hyacinths in soil but not sure how deep to plant. Should tip be above soil or few inches under? Hi Tina Marie – When planting in pots of soil, set the bulbs deep enough so their pointed tips are 1/2 inch below the soil surface. Keep in mind that hyacinth bulbs need 10-12 weeks of cold, dark storage in order to bloom. Have fun with your project! Your photos are gorgeous and I like your method very much. Can I force bulbs with that method now, in mid-January? I have a number of daffodil, hyacinth and tulip bulbs that I was unable to plant by the time they arrived (I ordered from the end-of-season sales, and some came after we had a blanket of snow on the ground). They’ve been all sitting in my attached garage since late Nov., but I don’t think it’s ever held steadily below 50 or so in there so I couldn’t consider these bulbs to be pre-chilled. Will the refrigeration of already potted (or ‘glass-and-pebbled’) bulbs for 12 weeks count as the pre-chilling? 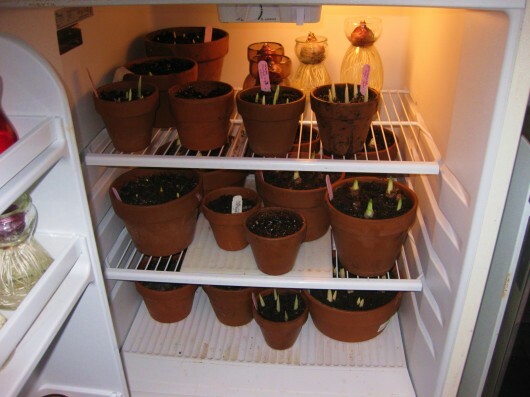 I’ve read elsewhere that I should chill the bulbs themselves in the refrigerator for the 12 weeks before potting them to force them, then potting or pebbling them, and THEN storing them in a cool dark place for several more weeks. I am starting this very late, I realize, but I will be thrilled to get blooms out of these still-plump bulbs if I can! Your method seems to last only 12 weeks from potting unless I have misunderstood (or unless you potted bulbs that you had already pre-chilled). I have a refrigerator that I can use for this purpose either way. I appreciate very much your time clarifying this for me. Thank you so much for your wonderful posts. Just beautiful! Hi Claire – I always pot (or vase) my hyacinths first, and then chill them in the fridge or some other cold, dark place for 12 weeks. Since the bulbs produce their roots during the cold duration, you don’t have to wait so long for blooms. Bulbs chilled un-potted require an extra month just to make roots, and then another month or 6 weeks to send up the flower stalks. But to answer your question: Yes, you can refrigerate your bulbs now! Thank you for responding so quickly Kevin. I will be potting up like a fiend today and will fill my fridge in a couple hours. After that, I will still have hundreds of unplanted bulbs to try to save, and am going to do some experimenting by trying a few different methods. I will plant some in flower beds that I had prepared for planting last October, but didn’t get to before the snow fell. I checked these beds yesterday and discovered that the soil was unfrozen and completely friable when I removed the snow from a small area of it and was able to dig into it easily. After planting them I will replace the snow cover for insulation. Keeping my fingers crossed that they’ll be protected enough to put down roots and stay alive, even if they do not bloom this year. My other plan is to layer large planter pots with tulips, hyacinths and then crocus and muscari. I would need to put those outside, but could keep them in a protected area near the house, and could mulch over them or do the newspaper mulching and covering with cardboard boxes to protect them further. A third idea is to store a number of them in the fridge in paper bags and then plant them both in the earth and in outdoor pots if it gets a bit more mild outside in the next month, which it sometimes does in Utah. Any thoughts you have on any of these plans would be appreciated. I’ve seen both encouraging and discouraging commentary about this online. I’d really like to know what you’ve experienced or heard. Have you known of anyone else to have planted bulbs in the unfrozen ground or in pots as late as in mid-January and have had them survive? I do not have my heart set on seeing blooms from them this year; I would be relieved and gratified just to know I am doing whatever possible save them now and see them in future years (rather then adding them to the compost pile). Thank you Kevin! What do you do after the flower is done blooming in a water base type vase. Do you let the petals just fall away? Can you keep the bulb in the vase or does it have to be planted in soil? Can it be planted in soil in a pot in the house? Hi Edna – When it comes to forced bulbs, some are worth keeping, others not so much. More details in this post: Forced Bulbs: What to Keep, What to Toss. 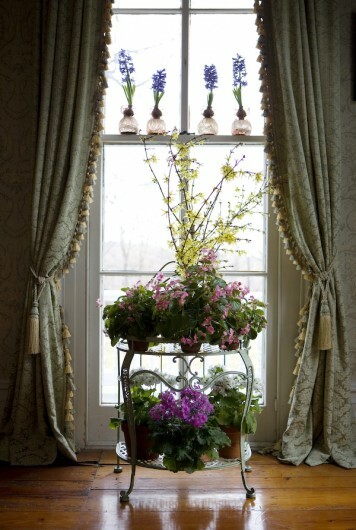 May I ask what the pink blooms next to the hyacinths near the window are? Thank you! Hi Emilie – Pink blooms are azaleas. I’m so glad to find this site! The flower arrangements – especially that spring portrait – are gorgeous! Today I purchased two hyacinths in water jars. They have roots of approx. 3 inches, and sprouts of approx. 5 inches, but have not yet bloomed. At this point, is it too late to pot them in soil if I would like to preserve them for next year?